Non-stop return flights from Milan to Sao Paulo, Brazil from €398! Cheap flights from Hungary to Taiwan are not that rare so here is one based on promotion of Air France-KLM. Based on service of SkyTeam you can book cheap return flights from Budapest to Taipei already for €354. This is including all taxes and fees, meals and checked bag. Good availability also this spring or autumn which is perfect time to visit this incredible destination. Flights have one layover either in Amsterdam or Paris on your way. If interested in this solution with Air France-KLM you will find the cheapest flights when departing from Budapest to Taipei in May or September 2019 to February 2020. Min stay 5 days. Max stay 3 months. No free stopover available. There is 23kg bag icluded. Fare class Feeder / Intercontinental leg is “L / X“. Air France promo sale is running till 31st of May or until sold out..
You can book your accommodation in Taipei via Hotels.com or Booking.com. Also you can further discount your hotel when using one of following promo codes. 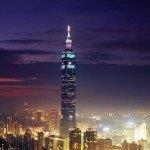 Booking sample of cheap Cheap return flights from Budapest to Taipei, Taiwan from €354! In this case your outbound flight from Hungary to Taiwan would be on 6th of September. Return from Taipei back to Europe on 22nd of Sepember 2019.